Three games at the club today. 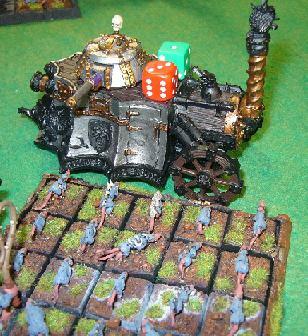 WHFB - Dan's Skaven took on Rob's Empire army. It was a classic Rat v Steam tank encounter, as you can see pictured here! DBMM 25mm - Andrew and Philip tried a game of 350AP on a 6 x 4 table. Andrew used the new draft Early Crusader list with Kn(O) and Bd(S), and Philip had Kushite Egyptians (without the Egyptian command this time). An unreliable Crusader ally-general kept the Crusader blades out of action until too late, and the Kushites got a 19-6 win. There were no major issues with deploying on a smaller table, but we did wonder how to fit the largest terrain pieces. 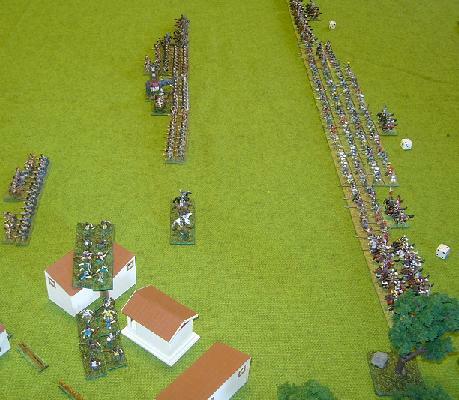 FoG-N - Brett (French) and Kendall (British) had a trial game of Field of Glory Napoleonics. The Old Guard did well! Robbie took 2nd Place in the Tin Soldier tournament using Orge Kingdoms. This was a high qulaity field of about 26 including some chaps from Wellington. Brett and Andrew had another FoGN game. Kendall (Afrika Korps Panzer company) beat Kit (Gurkha company) 4-3. 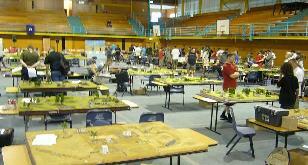 Nicon 2009 was held in the Napier Boys' High School hall, and there were more than 80 players. It was a really good venue, although rather cold early in the morning! Excellent standard of catering at the Heavens Bakery coffee cart as well. There were competitions in WHFB (approx 10 players), 40K (14 players), Bloodbowl (approx 8 players), Field of Glory ancients 15mm (10 players), DBR renaissance in 25mm (8 players), 1st Volley Napoleonics 15mm (4 players), and mid-war Flames of War (approx 26 players). Rob was in the FoW competition and took 4th place with his paras. Our Renaissance webpage has photos of the DBR competition where Philip was 2nd and John 3rd. Nicon 2010 will be held in Tauranga. The Hamilton club indicated that they were interested in bidding for Nicon 2011. FoG Ancients Al (Spartans) and Benny (Early Carthaginians) had another game in the AWC club competition. 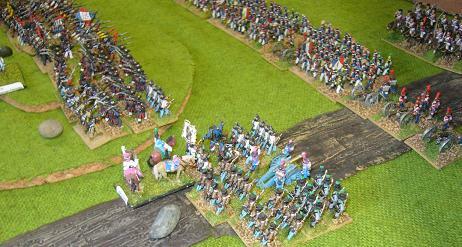 The Carthaginians were gaining the upper hand as bad light stopped play. FoG Napoleonics Brett and Andrew had a test game using the new draft of the Field of Glory Napoleonics rules. A scratch force of Neapolitans and Austrians took on the French, doing rather well. DBR 15mm Mark (ECW Parliamentarians) played Philip (Muslim Indians). A 9-1 win to the Indians. A close range firefight between Pi(I) and Bw(I) turned out to be a bloody affair, with a lone bowman being the last man standing. The English musketeers repelled most of the Sipahis and Elephants in the centre, but both flanks broke. WHFB Dan's Skaven played Matt's Orcs and Goblins. We had four games at the club today. Grant and Keith had a 25mm Russian Civil War game using Warhammer Historical rules. Benny and Philip played an AWC club comp game, FoG 15mm. Benny's Carthaginians beat the Pontic army. In WHFB, Dan's Skaven took on Rob's Chaos army. Brett's Russians played Kit's Germans in Flames of War. It was good to see more games happening at the club meeting today, with a couple of FoG games and some Flames of War, and DB-nothing. Field of Glory 15mm. 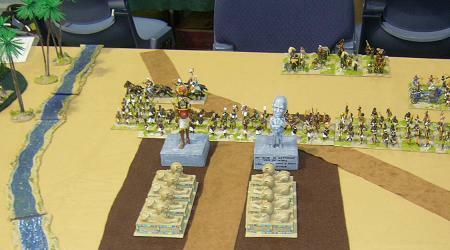 Philip (Pontic) played Michael (Late Romans) in an Auckland club competition game. Win to Mike. Brett and Kendall also had a FoG game, with Brett's Japanese beating Kendall's HYW English. In FoW, Lee brought along his new Hungarian army, featuring lots of Panzer VIs. They performed consistently, losing 6-1 to Kit's Russian Guards in the morning, and again to Rob's British paras in the afternoon. Rob also played Ken's Afrika Korps 90th Lt Div, losing 4-3. DBMM 25mm Brett was third in the competition, and won the best painted army award for his Medieval Germans (used by Kendall) and the Persians were also commended. Kendall got the award for the most sporting player. DBR 25mm Philip (Early Tudor English) won first place. 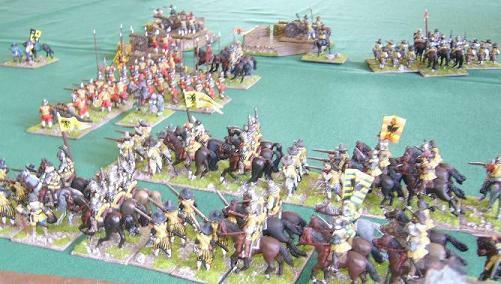 Lawrence's German Catholics (painted by Philip) were the best painted army, and placed 3rd in the competition. Flames of War Kit's 11th Hussars were the best painted army, featuring lots of hand-made armoured cars. Next year's Natcon will be run by the Hutt club, and there were indications of future conventions in Christchurch in 2011 and Auckland in 2012. This was our last meeting before Natcon, so a good chance to get in some practice games. In DBMM 25mm, Andrew's Crusaders won a 16-9 victory over Brett's Persians. The inert Crusaders had two flank marches and a delayed command, pretty much SOP for Andrew really. In DBR 25mm Philip's Tudor English beat Grant's French 10-0, but it was pretty close, only 1 element in it at the end. The game began in the fog, but as the armies moved towards each other unseen the fog quickly lifted and it was all action with a high casualty count on both sides. A couple of games on at the club today. 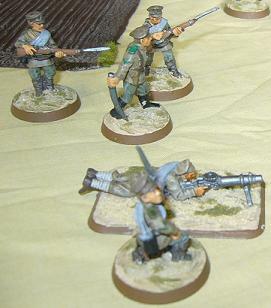 Firstly, Rob's British Paras were in a fighting withdrawal against Ken's Germans in Flames of War. The other game was between Philip's Algerians and Mark, visiting from the Waikato, using Parliamentarians. The Parliamentarian Ironsides and Lobsters easily beat the opposing flank of Algerian sipahis and light horse, and their inferior horse on the other flank held off a large force of Janissaries. In the centre of the battlefield a great mass of warbands attacked a line of pike and shot. The warbands kept up the attack for many bounds, but couldn't quite get the breakthroughs they needed, and were eventually defeated. Only one wargame on today, Graeme's Marian Romans taking on Philip's Mithridatics in DBMM 15mm. By the time we called it quits at the end of the day, one Mithridatic command was broken, and both sides had further commands close to breaking. The Pontic scythed chariots destroyed two enemy elements, and one friendly knight. At the brief AGM we re-elected the same committee and set fees at $40 for the year. BattleCry was held at a new venue this year, the ASB stadium in Kohimarama, and was a great success. There were lots of boardgames, card games, roleplaying (tabletop and live!) and Alf's Imperial Army made their customary appearance. There were a few trade stands, including Battleline Miniatures, who sponsored the prizes in the ancients competition. Our club was well represented in the 25mm DBMM doubles competition, with three teams: Al and Benny (Hannibal's Carthaginians); Andrew and Philip (Kushite Egyptians); and Brett and Lawrence, whose Medieval Germans won the painting prize. Kit ran the Flames of War competition, and Ken was competing in it. Grant, Rob and Nick were in the Warhammer Fantasy Battle competition. Rob's African themed Ogres are pictured below right. There were a couple of 15mm DBMM games at the club today. Al's Early Hoplite Greeks won 22-3 over Philip's New Kingdom Egyptians. Graeme's Marian Romans took on Kendall's Japanese. It was a hard fight between the Bd(S) and Pk(F). BattleCry is coming up in less than four weeks, so we had a couple of practice games. Rob and Garth played Warhammer Fantasy Battle (Ogre Kingdoms vs Warriors of Chaos - Khorne). A minor victory to Rob with a last turn fluke! Andrew and Philip played DBMM (Kushite Egyptians vs Early Crusaders). A 25-0 win to Andrew who was using the Egyptians. We also had a couple of Flames of War games. Ken's Germans won a 4-3 victory over Rob's Paras in a crucible battle, and then Kit's Russian Guards scored 6-1 in a breakthrough battle with Ken's German Mech Pioneers. Meanwhile Al is flying the (Spartan) flag at ValleyCon this weekend. A rather a quiet beginning to the year. Rob and Nick played a game of Warhammer Fantasy Battle. Al and Philip set up to play 15mm DBMM, but the Pharaoh retired hurt and the game was abandoned.